How's this sound: A movie subscription that lets you watch unlimited movies in theaters for 50 bucks a month. It's like Netflix but for the real, real life. Would that be something you're interested in? 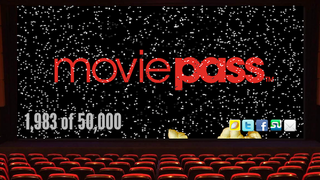 Called MoviePass, it's a service that'll let users use a smartphone app to handle all their movie bookings. For 50 bucks a month (additional $3 for each IMAX or 3D), users of MoviePass will get unlimited access to any movie playing in participating theaters. If you're not that psycho about watching movies, they also have a 'lite' package of 4 movies for 30 bucks. Either way, they're rolling out a private beta in San Francisco right now that includes 21 different theaters and hopes to expand to other US cities throughout the summer. The goal is to put MoviePass in 40% of the theaters across the US.